Residents in Webster, Massachusetts, are trying to pick up the pieces days after a tornado tore through their community over the weekend. An EF-1 tornado from Dudley to Webster, Mass. was reported at 110 mph on Saturday. The tornado caused extensive damage in Webster, specifically on Main Street. Many businesses were damaged, and the clean-up is just beginning; two buildings have already been demolished. 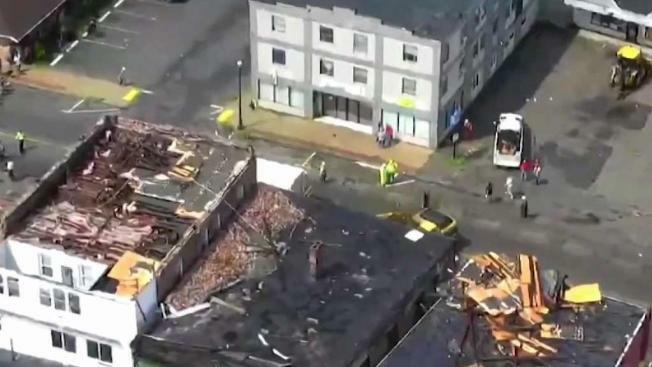 The cleanup in Webster, Massachusetts has been tough following a destructive tornado that touched down in the area. However, the community has banded together to clean the mess left by the powerful storm as things get back to normal. An EF-1 tornado slamming from Dudley to Webster was confirmed by the National Weather Service Saturday. Dozens of people were displaced and businesses were damaged by the storm. The town provided displaced residents a Regional Resource Center from 11 a.m. to 2 p.m. Monday at the Webster Senior Center. The American Red Cross was at the scene providing aid shortly after the twister. "The tenants there will continue to be taken care of by the Red Cross until we have a full analysis of what, if they’re going to be able to move back or not," said Webster Town Administrator Doug Willardson. 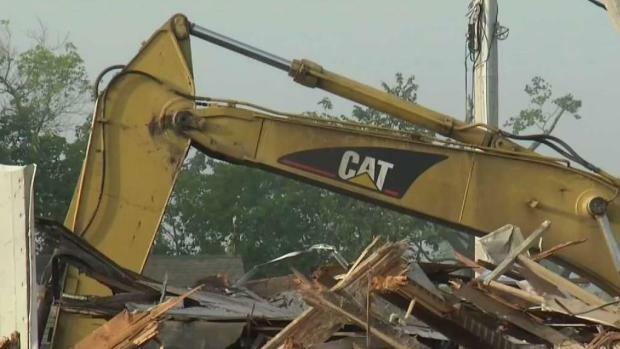 Residents in Webster, Massachusetts continue to clean up after a tornado tore through the area on Saturday. Mary Cruz and Ashleigh Grampetro were just two of the many people affected by the tornado who sought help from the Resource Center on Monday. "I have an 11-month-old son and I’m currently pregnant right now with my next son, so it’s kind of just, where do we go from here," asked Grampetro. Both women and several other residents of 41 Main St. who NBC10 Boston spoke with said they were frustrated that they have been unable to reach their landlord. "Everybody’s frustrated, there are 30-35 people that are without a home, kids, elderly, everyone, we don’t know what we’re supposed to do," said Cruz. "We’ve all called her, no answer, no type of information on what we’re going to do, nothing," Grampetro added. That landlord, Teresa Wolverson, did end up showing at town hall later in the day and tried to respond to questions. The Webster, Massachusetts community is slowly coming together after an EF-1 tornado slammed the town over the weekend. "I don’t know anything more than them, we have been in contact with each other non-stop, other than that tenant over there but everybody else, I know that they’ve been taken care of by the Red Cross," said Wolverson. 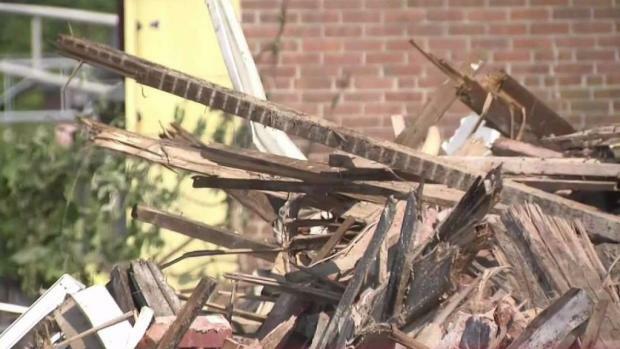 Two buildings on Main Street were so severely damaged that officials made the decision to demolish the structures once they were deemed unstable. A third building may have to be knocked down, as well. At the East Main Plaza, plywood now covers a number of storefronts, including Exotic Rayz. The tanning salon’s windows were blown out, sending glass everywhere and forcing owner Michelle Mandeville to temporarily close up shop. "The insurance company is going to walk me through this. Thankfully we had people that were in the vicinity because so much was going on and they came and boarded us up no questions asked," said Mandeville. On Emil Street, the roof of one home is damaged, the walls of a nearby garage buckled, and Paul Canty’s backyard garden is buried under a crush of fallen trees and limbs. "It was over in what seemed like seconds," Canty recalled. "My wife said it sounded like a train coming through. Resident Marie LaFountain is worried about her elderly mother. They're still without power because a tree fell on their apartment building. "I have to take it down. The building inspector has to come, if he OKs it, then they can they can turn his back on," LaFountain said. The town of Webster released a statement Sunday thanking the first responders and assisting agencies who helped the community in wake of the tornado. 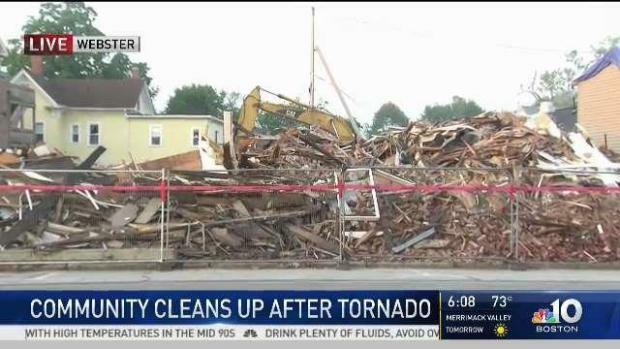 2 Buildings Demolished Following Destructive Tornado in Webster, Mass. "Our hearts are with those that lost their homes in the tornado," the town said. "We wish you the best as you move forward and offer any assistance we can."